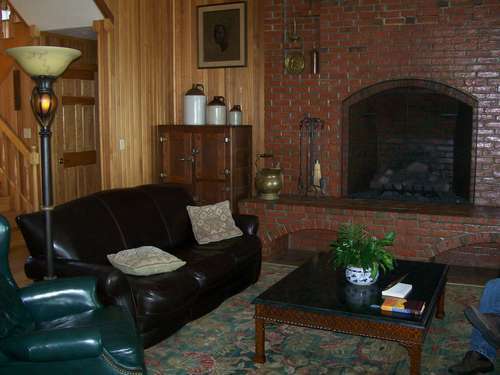 08.25.07 The luxurious Crohn Family Conference Center in Perry, Maine was the venue for the first St. Croix River Valley International Chess Classic on August 18, 2007. 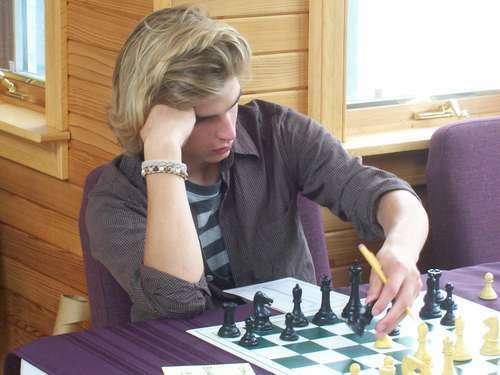 Connecticut resident Tom Little topped the seventeen-player field with 3.5 points. 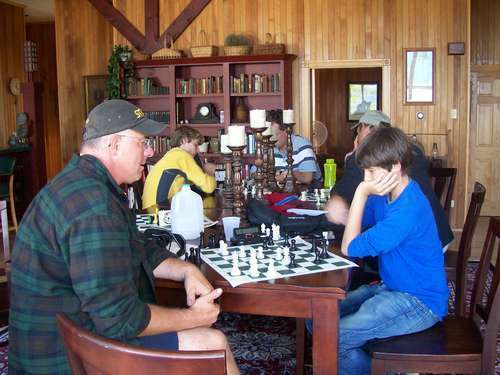 He was closely followed by a group of four players tieing for second place with 3.0 points. 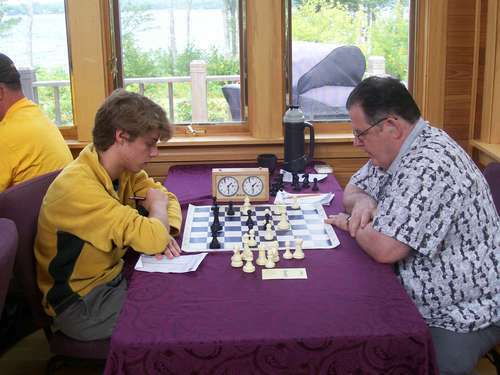 Here's the richly illustrated tournament report with USCF crosstables. 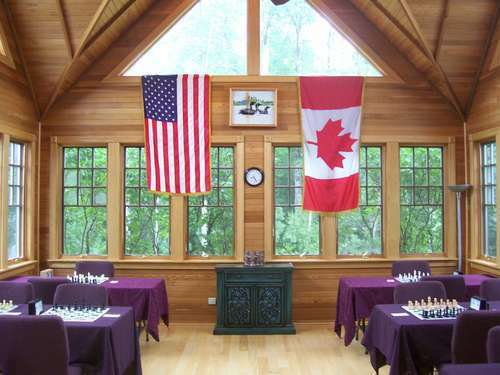 The beautiful tournament room at the Crohn Family Conference Center, site of the first St. Croix River Valley International Chess Classic. 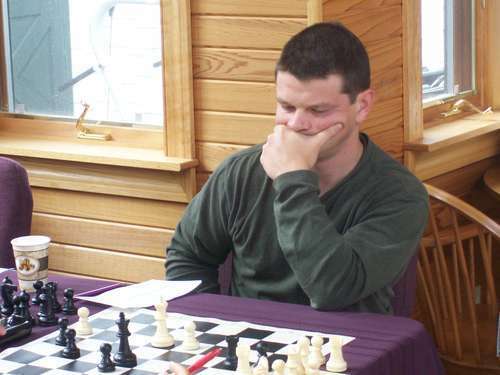 Tom Little's half-point bye in the first round was a fortuitious harbinger of the final result of the tournament as that half point turned out to be the winning margin for the Connecticuter. The four players tieing for second place with 3.0 points were: Roger Morin, Todd Snyder, Gremaine Kickert (an exchange student from Germany spending the year in Maine) and Lucas McCain. 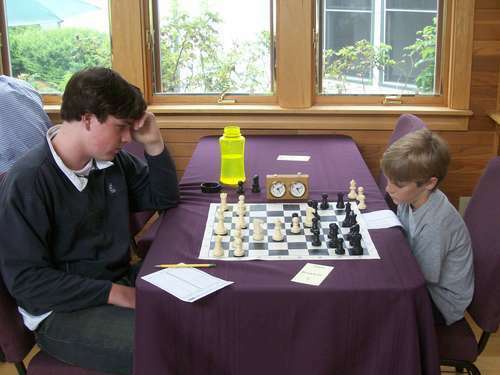 Trailing this group and tied for 6th were Denker Tournament of High School Champions participant and 2007 Maine high school co-champion (with Lucas McCain), Cullen Edes and Zenning Chen, a former Orono high school student (and high school state champion in 2002-2003) now attending Stanford University. 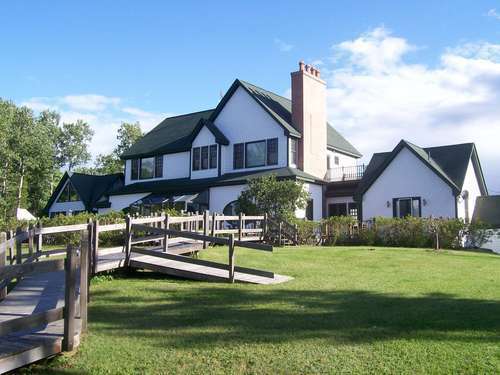 Under bright blue August skies and surrounded by wilderness and water, the Crohn Family Conference Center was a magnificent site for the St. Croix International. 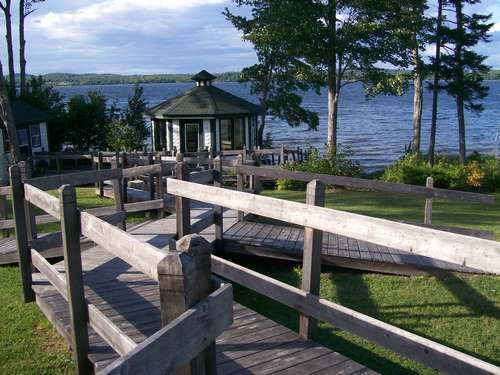 We hope this tournament will become an annual event on Maine's tournament calendar. 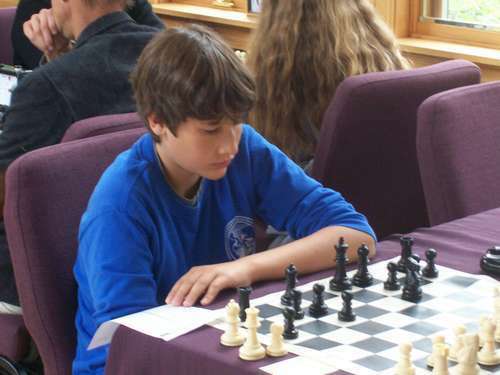 The tournament was organized and directed by Alba Briggs and we thank him for contributing to this report. 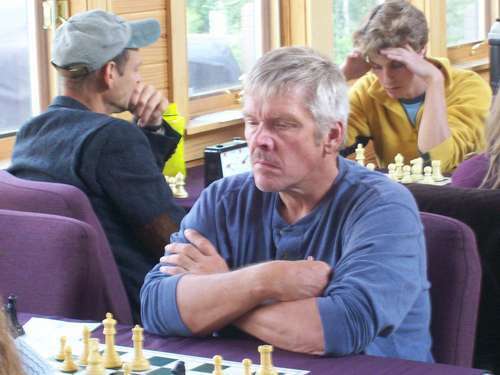 USCF Crosstable of this event. For all the frijoles: Lucas McCain (left) battles Tom Little in round 4. Going into this game, McCain had 3.0 points, and Little had 2.5 thanks to two wins and a first round half-point bye. Little prevailed to take first with 3.5 points; McCain tied for second with 3.0. 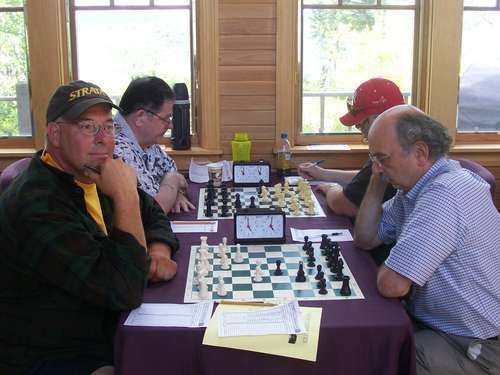 Roger Morin (right) finished tied for second in the tournament. 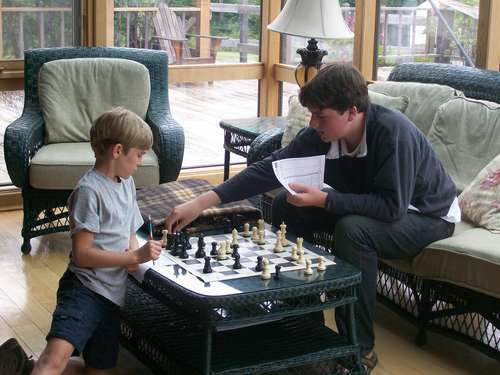 Here he is playing the white pieces vs. Cullen Edes. 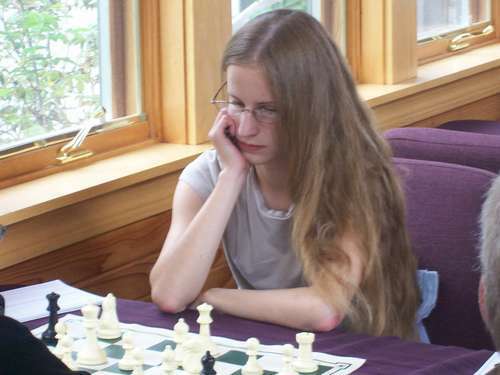 Germaine Kickert (left) on her way to beating Zenning Chen in the final round. 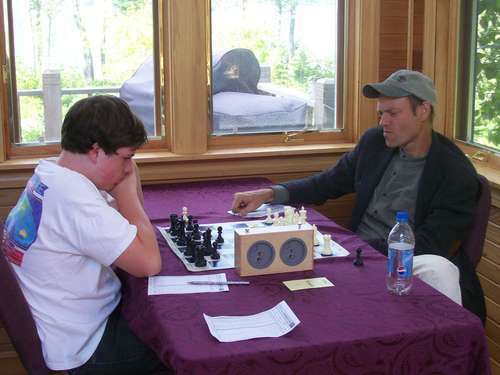 Second place finisher Todd Snyder (left) strikes a pensive, relaxed pose during his game vs. Tom Sandford that is reminiscent of the great Harry Nelson Pillsbury. Paul Wlodkowski Jr. assesses his position. Peaks and valleys, everyone has them but none more dramatic than Hoty Briggs' last two tournaments: clear first at the WCCF July Swiss without a loss, last here without a win. Lily Ann Briggs could manage only one point each this time around. Todd Snyder (left) and Paul Wlodkowski Jr. in the skittles room. 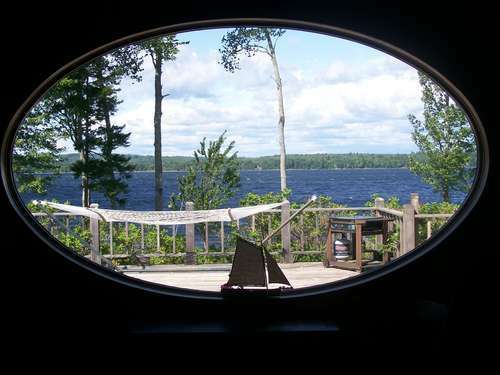 Out the skittles room window. That hammock looks pretty inviting. 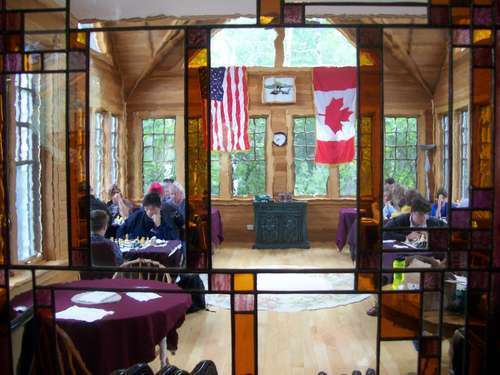 The St. Croix River Valley International Chess Classic as seen through a stained glass window. Does anyone know who I can contact about having an event at the Crohn Center? You always were a drama king, Hoty.